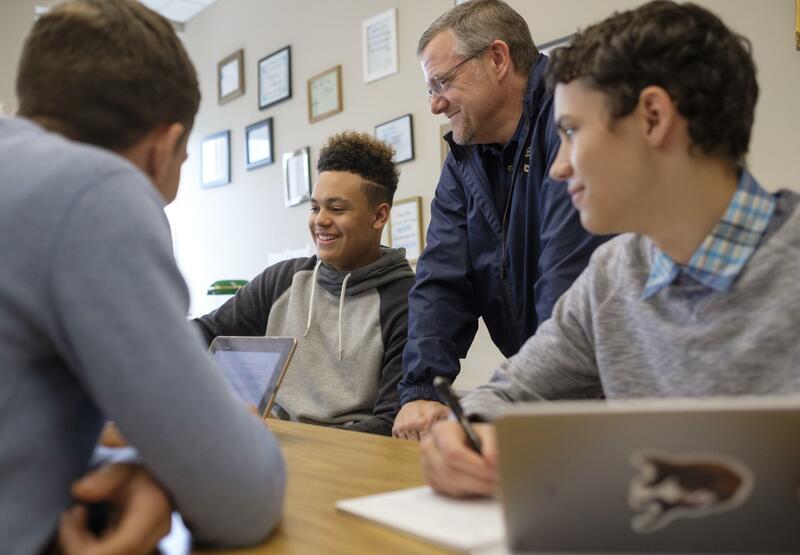 Seton Catholic High School is committed to the use of technology in our academic program as a tool to expand learning opportunities and conduct scholarly research. iPads provide students with a content delivery device for classes through communication with teachers. Student textbooks are preloaded on the iPads and are ready for student's use. Teacher to student communication through messages, handouts, articles, and the use of audio/video files provide essential preparation for college. The use of technology facilitates global collaboration, which is a vital skill for our 21st-century learners. At a basic level, students won't need to carry heavy textbooks back-and-forth from home to school. iPads assist students in their daily preparation for classes with many organizational tools and ease of access. iPads also allow students to keep all of their coursework in one easy-to-access device. Many of the textbooks students use on their iPads have interactive resources and additional web tools. Our students use iPads as a reference library for their courses as well as providing them with immediate access to unlimited research tools. Students can turn in assignments electronically and teachers will be utilizing electronic textbooks, which are also less expensive. iPads also provide our students with an e-reader device which significantly reduces paper consumption. iPads help us reach the goal of our moral and spiritual responsibility to care for the creation we have been given consistent with Pope Francis's call to conserve our resources. Students at Seton Catholic participate in a technology orientation each fall at the beginning of school. We also offer training to parents in the fall. Our tech specialist, Mr. Pyatt, is available to assist students with their tech questions. Seton Catholic has implemented a wireless infrastructure that provides the appropriate access control for our students. Students at Seton Catholic utilize iPads on a wireless network. All iPads are for educational use consistent with the educational goals of Seton Catholic. Along with the opportunity this provides comes responsibility. The Acceptable Use Policy is designed to give students and their families clear and concise guidelines regarding the appropriate use of iPads as well as other computers on the Seton Catholic College Prep campus. The underlying premise of this policy is that all members of the Seton Catholic community must uphold the values of honesty and integrity. This policy was created to protect our students and we expect our students to use good judgment and to utilize technology with integrity. All protocols and procedures in the Seton Catholic iPad Manual are in effect. The iPad Manual covers information regarding the iPad Program and is created by our Technology Department. At Seton Catholic, each student has cutting edge technology at their fingertips. Each student receives an iPad with all the necessary textbooks preloaded. Our teachers also communicate, send and receive homework through Google Classroom, similar to the technology used in most colleges and universities.